Mindika Moments: Get all your Omega 3's by eating Lemon Pie?? Get all your Omega 3's by eating Lemon Pie?? Sounds too good to be true?? Maybe not. If you've been a follower of my blog, you know about the constant fight with my husband about fish. He hates fish...except for tuna, you know the canned kind...which isn't really "fish" fish...in my opinion. Don't get me wrong. I love a good tuna fish sandwich, but I really love Salmon and Talapia and Mai Mai and...I could go on and on. I have yet to meet a fish I didn't love. Before I got married I ate fish at least three times a week. So I never really worried about my Omega 3 intake. But since my three fish a week habit no longer exists, I'm always on the look out for ways to get good Omega 3's into my families diet. I used to take Omega 3 supplements, but I hated the terrible aftertaste they'd leave. I would be burping up fish for the next 3 hours, and aftertaste aside you can't give supplements to children. I tried the Omega 3 gummies, but those were disgusting. Even with a gummy candy disguise, my 3 year old was not fooled. Then one Saturday at Costco they were sampling this stuff. I'm actually surprised I stopped. Unlike most people, I'm not a Costco sampler. I usually avoid sample days. But for some reason I stopped. I didn't even know what it was, but I'm soooo glad I stopped. This stuff is amazing!! It really tastes like lemon pie, with the consistency of a thin yogurt. I kind of feel like I'm getting a little dessert. 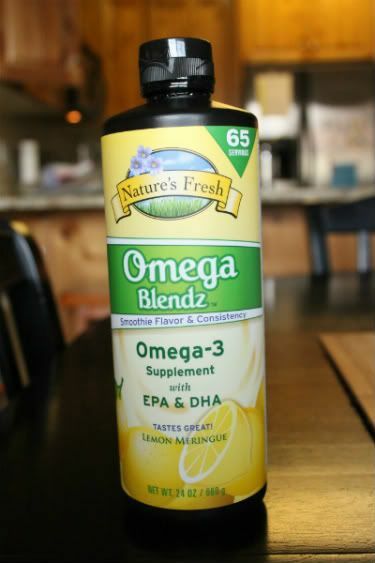 Just two teaspoons a day, and one teaspoon for the kiddo's, and you get all the healthy Omega 3's you need. I have to note that there were a couple reviewer's on the Costco website that claimed they thought it tasted fishy and they didn't like it. That was 2 reviewers out of 50. But I really don't get that. I can't taste the fish at all. All I taste is yummy Lemon. Even my 3 year old loves it and always wants more more than her one allotted teaspoon.